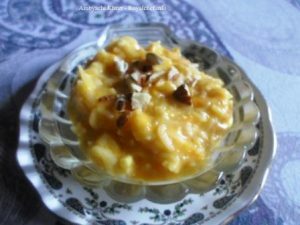 This is a simple and easy to understand Recipe for preparing at home sweet, tasty and delicious typical Maharashtrian Style Mango Kheer or Ambyachi Kheer as this Kheer variety is called in the Marathi language. This is a special Kheer dish, which is prepared during the Mango Season using fresh Mangoes; otherwise Canned Mango Pulp can be used when Mangoes are not in season. For the Fresh Mango Pulp: Wash the 2 Mangoes, peal the outer skin and then cut them into small pieces and then blend in the mixer. 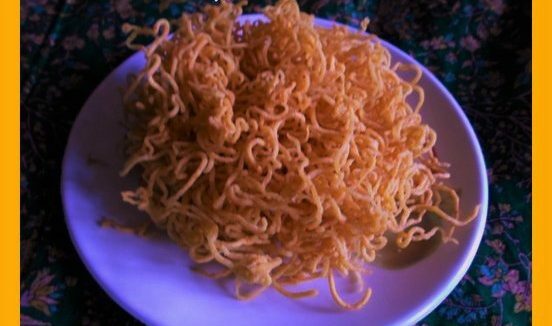 In a kadai add the Ghee, Sevai and fry for 2 minutes on a slow flame, then add the Milk and boil for five minutes on a slow flame. Then add the Sugar, Cardamom Powder and cook for five minutes on a slow flame. Remove from the flame and keep it aside for cooling. After the Kheer cool down add the Mango Pulp and mix it well and keep the Kheer in the refrigerator for two hours. While serving the Ambyachi Kheer garnish it with Dry Fruits.